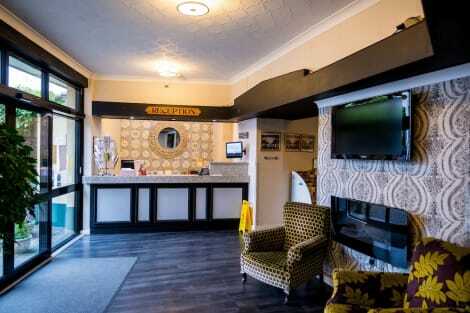 Located in Carmarthen, The Ivy Bush Royal Hotel By Compass Hospitality is a 1-minute drive from Carmarthen Castle and 6 minutes from Carmarthenshire County Museum. This hotel is 8.9 mi (14.3 km) from National Botanic Garden of Wales and 9.3 mi (15 km) from Kidwelly Industrial Museum. Treat yourself to a stay in one of the 16 guestrooms, featuring fireplaces. Complimentary wireless Internet access is available to keep you connected. Conveniences include phones, as well as coffee/tea makers and a turndown service. Located in Carmarthen, Alltyfyrddin Farm is in a rural location, a 3-minute drive from Carmarthenshire County Museum and 7 minutes from Carmarthen Castle. This farm stay is 3.9 mi (6.3 km) from Oriel Myrddin and 4.6 mi (7.5 km) from Afon Gwili. The delightful town of Carmarthen is sure to charm you with its blend of old and new attractions. Thought to be the oldest town in Wales, this historic destination has a rich legacy to discover. In addition, the centre has recently undergone significant urban development and regeneration, meaning that it provides myriad opportunities for entertainment and escapism. With easy rail links from both Cardiff and Swansea, too, there's every reason to choose Carmarthen for your next getaway. When we say that Carmarthen is an historic place, we mean it. Going back almost two thousand years, the town was the capital of the Demetae tribe under Roman rule, and was known as Moridunum. The Roman influence can be seen to this day: just east of the town is one of the only surviving amphitheatres in the UK. This surprisingly well-preserved ruin is worth a visit due to its impressive size. Carmarthen is also the starting point for one of Britain's most enduring legends. Rumour has it that the mysterious Arthurian figure Merlin was born in a cave just outside the town – although this is admittedly the subject of historical debate. In more recent times, the town was used as the base for two prisoner-of-war camps during World War II. There are numerous wartime pillboxes and anti-tank armaments dotted around, so military buffs should be on the lookout. Shopaholics will be right at home in Carmarthen. The redevelopment of the town centre has been a resounding success, with the result that it is now one of the premier shopping and urban leisure destinations in South Wales. National chain stores populate both St Catherine's Walk and Merlin's Walk, the two main pedestrianized shopping areas, while the Apollo cinema has to be experienced to be believed. This ultra-modern facility is the first fully-3D, all-digital cinema in Europe, and boasts Sony 4K projection in addition to VIP seating. In addition to the range of top chain restaurants to be found in the town centre, including Prezzo and Harvester, there's also a fantastic indoor market which hosts some of the best local produce from the surrounding area. Meats, cheeses, breads and much more are offered in a welcoming, informal atmosphere. Be sure to visit on the first Friday of the month, as this is when the farmers' market takes place. There are numerous Carmarthen hotels and B&Bs, with the Spilman Hotel well regarded for its central location and friendly staff. A little way out of the town, meanwhile, is the Glangwili Mansion, a popular B&B which allows you to experience the countryside around the town in all its glory.